Mercedes-AMG is showing courage and with the new CLS 63 AMG Shooting Brake is presenting a performance trendsetter in a new market segment. The CLS 55 AMG already had no direct competitors back in 2004. The first four-door performance Coupé inspired other automotive manufacturers and over the years has come to be copied many times. 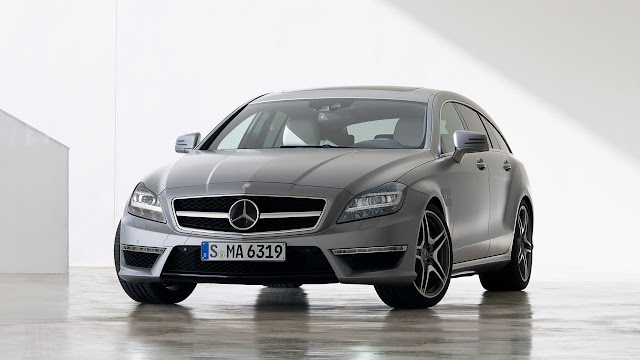 The successor model presented in 2006, the CLS 63 AMG with an AMG 6.3-litre V8 engine, and the current CLS 63 AMG with the 5.5-litre V8 biturbo engine available since 2011, have consistently continued this strategy. 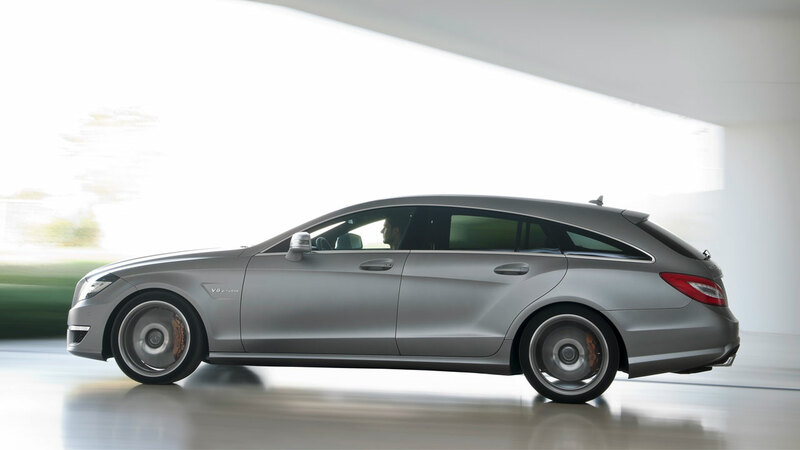 According to Ola Källenius, Chairman of Mercedes-AMG GmbH: "After the successes of the CLS 55 AMG and CLS 63 AMG, with the new CLS 63 AMG Shooting Brake we are consistently pursuing the philosophy of offering our customers unrivalled, exciting high-performance cars. 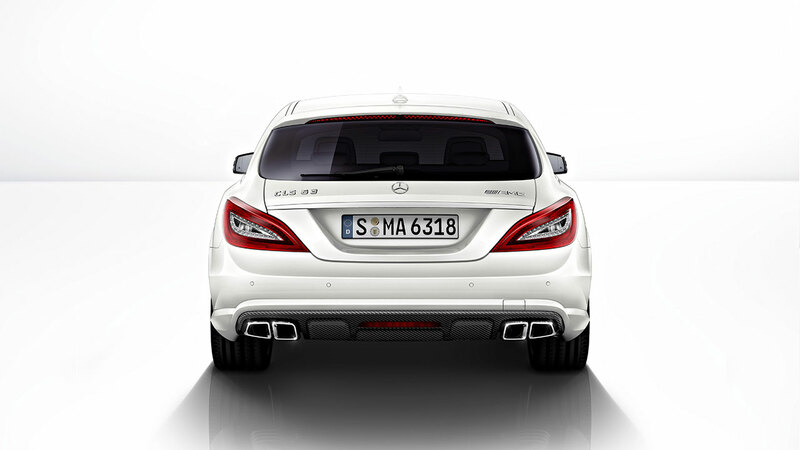 The CLS 63 AMG Shooting Brake is establishing a completely new, small and select niche sector, and is expected to delight new customers just as much as it will existing AMG enthusiasts. The combination of performance, style and usability is unique." The AMG 5.5-litre V8 biturbo engine impresses with a combination of direct petrol injection with spray-guided combustion, piezo injectors, biturbocharging, air/water intercooling, generator management and ECO start/stop function. 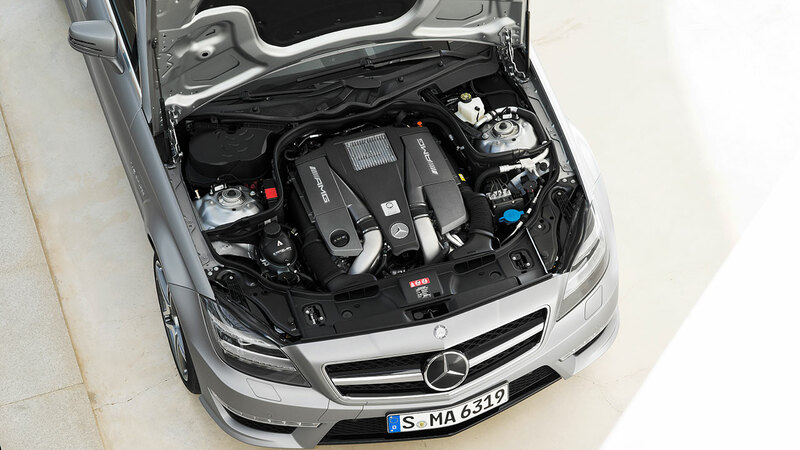 The eight-cylinder engine is the embodiment of pure dynamism and high efficiency: offering power output and torque levels of 386 kW (525 hp) and 700 Nm respectively, the effortless superiority of the CLS 63 AMG Shooting Brake can be enjoyed by the driver over every single kilometre. In conjunction with the Edition 1 these figures are pushed to410 kW (557 hp) and 800 Nm. Both variants offer driving performance of the highest calibre: accelerating from zero to 100 km/h takes 4.4 and 4.3 seconds respectively, and the top speed is 250 km/h (electronically limited). The AMG eight-cylinder engine is not the only highlight – the AMG SPEEDSHIFT MCT 7-speed sports transmission also boasts exciting levels of performance and efficiency. Equipped with four individual transmission modes as well as automatic double declutching and RACE START functions, its power delivery is characterised by responsiveness and maximum variability. In "Controlled Efficiency" (C) mode, the ECO start/stop function is always enabled and switches the eight-cylinder engine off when the vehicle is at a standstill. In "S" (Sport), "S+" (Sport plus) and "M" (Manual) transmission modes, the engine and transmission are significantly more responsive: short, precisely defined interruptions of ignition and injection result in faster gear changes under full load. The suspension, steering and braking system of the CLS 63 AMG Shooting Brake complement the high-tech drive system perfectly. The AMG RIDE CONTROL sports suspension, with steel suspension struts on the front axle and air suspension struts on the rear axle, as well as automatic level control, is enhanced further by an electronically controlled damping system; it automatically adjusts the damping characteristics depending on the driving conditions and reduces the roll angle of the body. The effect of this is lightning-fast adjustment between optimum driving comfort and the best possible agility. The driver can switch between the three suspension modes of "Comfort", "Sport" and "Sport plus" at the press of a button. The 3-stage -ESP® with SPORT Handling mode also enables three individual control strategies to be selected at the press of a button. The AMG-specific front and rear axles with greater negative camber and optimised elastokinematics help to provide more stability at higher cornering speeds as well as better contact with the road. The front axle, with a track width which is 56 mm wider, is the optimum match for the electromechanical AMG sports parameter steering. It features a more direct ratio, variable power assistance which adapts according to the suspension mode, and also contributes towards reducing fuel consumption since the steering assistance system only draws power when the vehicle is actually being steered. Perfect deceleration even when driving extremely briskly is provided by the AMG high-performance braking system with 360 mm ventilated and perforated brake discs all-round. Particularly resistant, motorsports-tested composite technology is used on the front axle. The optional AMG ceramic high-performance composite braking system with yet larger brake discs and specially painted brake callipers with "AMG Carbon Ceramic" lettering ensures an even higher level of braking performance as well as lower unsprung masses. Good contact with the road, meanwhile, comes courtesy of the titanium grey-painted, high-sheen AMG light-alloy wheels featuring a triple-spoke design and fitted with 255/35 R 19 tyres on the front and 285/30 R 19 tyres on the rear. The excitingly elegant design idiom of a sensational vehicle design is combined in the CLS 63 AMG Shooting Brake with a distinctly sporty sense of dominance. Its high levels of performance are visibly expressed in such elements as the powerful AMG front apron with cross strut finished in high-gloss black, the AMG radiator grille with single slat and the AMG-specific design of the bonnet. Further dynamic highlights also include the original, broader front wings with "V8 BITURBO" lettering, the AMG-specific rear apron with diffuser look and the AMG sports exhaust system with two chrome twin tailpipes. High-performance LED headlamps including Intelligent Light System and adaptive Highbeam Assist are fitted as standard. 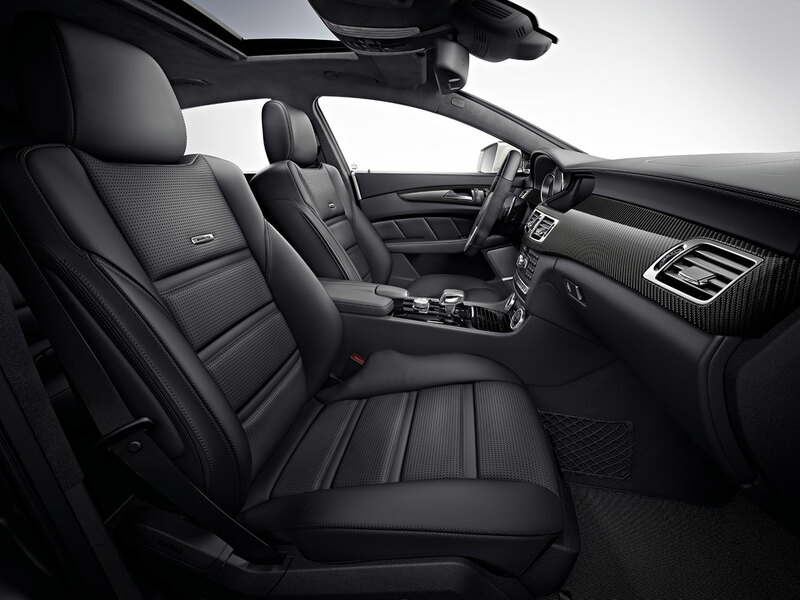 From the quality of materials and workmanship through to the exclusive atmosphere, the interior of the CLS 63 AMG Shooting Brake meets the very highest of standards. AMG sports seats in nappa leather with multicontour seat and memory functions, AMG black piano lacquer trim and the AMG-specific analogue clock featuring an IWC design all help to create a unique aura. The driver is also kept perfectly and fully informed too thanks to the AMG instrument cluster with AMG main menu including RACETIMER and AMG start-up screen. The transmission modes, suspension setup, ESP® functions and the AMG program can all be configured via the AMG DRIVE UNIT with E-SELECT selector lever – a special feature exclusive to AMG – which is integrated into the centre console and angled towards the driver. Visually striking, ergonomic and reassuringly tactile: the AMG Performance steering wheel in nappa leather features a three-spoke design with flattened top and bottom sections, a special shape, perforated leather finish and silver coloured aluminium shift paddles. A newly introduced feature on all AMG vehicles is the chrome-look electronic key with AMG emblem. 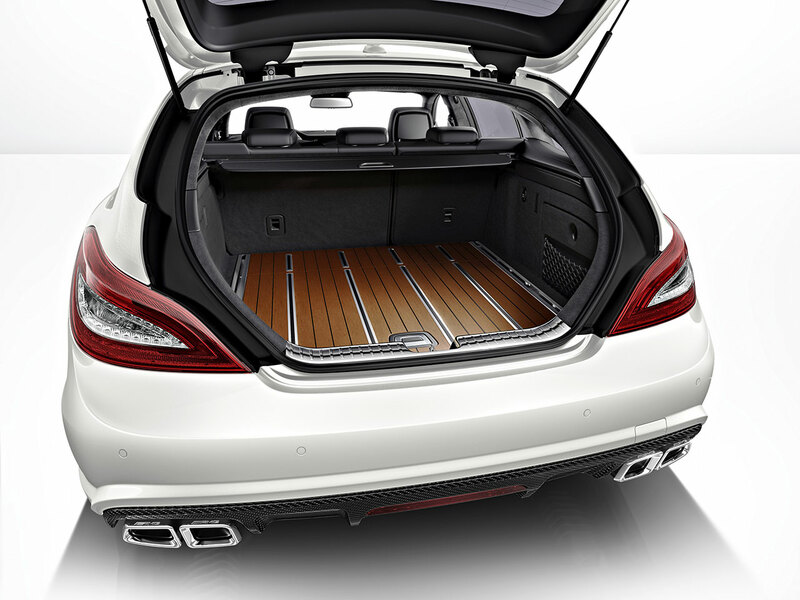 A highlight among the extensive range of optional extras is the designo wooden luggage compartment floor. This luggage compartment floor is made of open-pore American cherry wood, a decorative fine wood traditionally used in superior interior design work, high-quality furniture and exclusive ship outfitting applications. Selected veneer sheets are glued and pressed together by hand in cross-bonded layers to achieve high dimensional stability. The blanks are milled into their precise shape using a CNC machine, and the surfaces sanded to a smooth finish, waterproofed and oiled to highlight the natural beauty of the wood. Inlaid work using darker smoked oak, precisely cut into three millimetre strips using laser technology, helps to enhance the design of the wooden floor. The aluminium rails, manufactured using an extrusion moulding process, have a brushed finish as well as rubber inserts, and not only help to protect the wooden floor but also feature anti-slip properties. 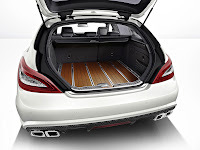 Also optionally available for the CLS 63 AMG Shooting Brake is the Bang & Olufsen BeoSound AMG high-end surround sound system with 16-channel DSP amplifier, ICEpower amplifier, total output of 1200 watts and 14 high-end loudspeakers. 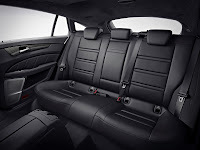 Also optionally available at no extra cost is the single-tone Exclusive PASSION leather upholstery in black, including dashboard and beltlines finished in nappa leather. This also includes matching designo velour floor mats in black. 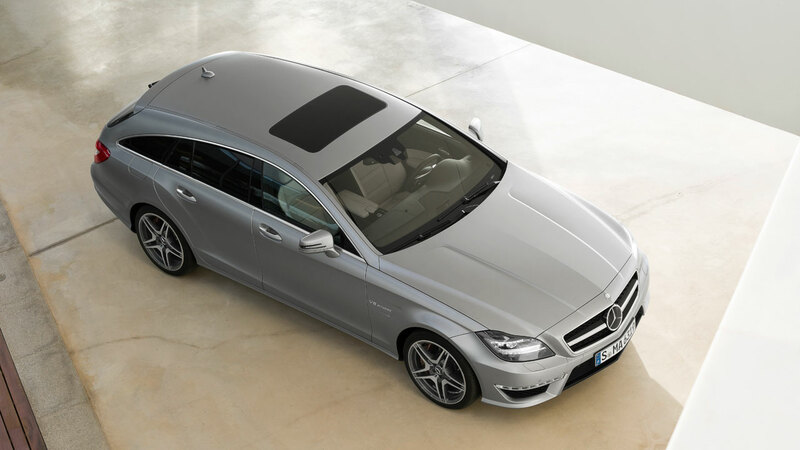 The market launches of the CLS 63 AMG Shooting Brake and the CLS 63 AMG Shooting Brake "Edition 1" will commence in October 2012.